Dorothee VandeWalle is an internationally-renowned classical Pilates teacher. She is the founder of the M.A.T. Pilates Teacher Certification Program and is recognized as one of the leading teacher trainers and master Pilates practitioners in the world. Dorothee has been teaching Pilates for 30 years and has trained individuals at all levels of fitness from elite athletes to injured and/or older clients. Dorothee teaches in the tradition of the original, authentic Pilates method. She was the protégé of Romana Kryzanowska—who herself was the protégé of Joseph Pilates—and started her teaching career with Romana in New York City. A former classical dancer, Dorothee is originally from Belgium. She's been teaching Pilates in Seattle since 1993. Lauren Albert has been a certified Pilates instructor since January 2003 and has been training under the guidance and supervision of Dorothee VandeWalle since she began her Pilates journey in 2000. Lauren studied dance and fitness, and her clients appreciate her clear direction and sense of movement. She has been teaching at Metropolitan Pilates since 2003. Christopher Blackburn received his M.A.T. Pilates certification in the Spring of 2006. Chris is a trained gymnast and former dancer whose interests include nutrition and healthy eating. He loves teaching Pilates and enjoys making each workout fun yet focused and effective. Chris has been on staff at Metropolitan Pilates since 2006. 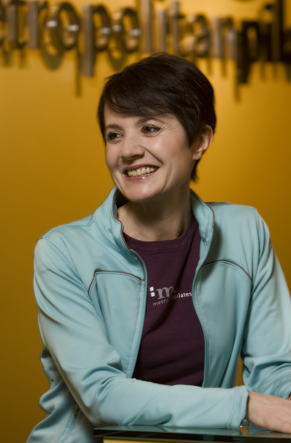 Maggie has been training at Metropolitan Pilates since 2010 and completed her M.A.T. Pilates certification with Dorothee VandeWalle in 2018. Clare Kennelly has been teaching Pilates since 2002. Before relocating to Seattle, she taught in the Washington, DC area and studied with Peter Fiasca and Pure Joe Pilates. At Metropolitan Pilates, she studied with Dorothee VandeWalle and was M.A.T. certified in 2008. Clare graduated from Smith College with a BA in Literature and a minor in Theater and Dance. She's passionate about sailing and also enjoys rowing, swimming and ballroom dancing. Shirly Liu joined M.A.T. Pilates in 2015 and has made Pilates an important aspect of her life. Shirly has been a physical therapist for over 10 years and believes that Pilates gives you the strength and flexibility so needed for good health and rehab. Shirly has a background in contemporary dance and enjoys gardening and taking long walks with her dog. Carol Meachum launched into Pilates several years ago and never looked back. Carol is not only an enthusiastic spokesperson for how Pilates can change the shape of one's body, but how it can change one's outlook on life as well. Carol has been teaching since 2003 and her clients love and appreciate her special brand of unbridled enthusiasm. Rick Morris has been a student of Pilates since 1995. He completed his apprenticeship through The Pilates Studio and with Dorothee VandeWalle. He has taught at Robert Leonard, Pilates Seattle International and at the University of Washington Women's Center. Rick's exercise background includes cycling, hiking, street skating and running. Rick has been on staff at Metropolitan Pilates since 2003. Svetlana is a contortionist performance artist and an original cast member of Teatro ZinZanni. Originally from Russia, she studied at the Kiev Circus Academy and has performed at some of the most distinguished venues in Europe. She started Pilates with Dorothee in order to keep her body free of injury. She joined the M.A.T. Pilates certification program in 2015 and has been part of the staff at Metropolitan Pilates since 2016. Dara Schwartz credits Pilates with changing her body. She has been training with Dorothee VandeWalle since 2009 and in 2011 completed her M.A.T. Pilates certification at Metropolitan Pilates. Dara graduated from the University of Washington with a BA in Women's Studies and a focus in Psychology. Her interests include cooking and nutrition. Adrianna van Elswijk credits Pilates with giving her the increased strength of mind, body and spirit needed to address health and personal challenges. She began her apprenticeship at Metropolitan Pilates in April of 2006 and was M.A.T. certified soon thereafter. Adrianna combines her educational and practical experience in Pilates, theater, ballroom dance, clinical social work and entrepreneurship in a caring and humorous, yet demanding, teaching style. Silvia Furia was certified as Pilates instructor in 2002. She was trained by Dorothee VandeWalle and Romana Kryzanowska at The Pilates Studio and Physical Therapy Center of Seattle. Born and raised in Rio de Janeiro, Silvia was trained in classical ballet and danced with the Ballet do Rio de Janeiro before coming to the United States to study English. She has lived in the United States for over 30 years and has graduated from Whitman College. She worked at Microsoft Corporation until 1999, holding various positions in project management, business management, and product planning. During my ski career, I had always trained with the best—the best coaches, the best gear, the best nutrition. I had solid endorsement deals with Rossignol and I enlisted the help of top trainers from all over the world. So it was just in my nature to go seek out the best in Pilates training. I was willing to go anywhere in the world to get the best training. I was sent to Dorothee VandeWalle at Metropolitan Pilates in Seattle, Washington." At Metropolitan Pilates we know there is more than one way to teach something, and each of our certified instructors recognizes the need to tailor their teaching to each student's style of learning. All our teachers have been thoroughly trained by Dorothee VandeWalle and know how to coordinate a personalized Pilates workout that will benefit each individual. Our primary concern is always safety, and teachers are well versed on how to modify and tailor a program for different levels of fitness and for those who currently have or are recovering from injury.